I noticed that I use more and more social media tools and different tools to communicate. Maybe I use too many of them. So I decided to create a list of them to see what I could weed out. I decided to share the list with remaining tools with you. I write this blog in WordPress. I think it works great. Easy to use and very effective. Following other blogs is much more difficult. My most valuable tool is probably Flipboard combined with Google reader. 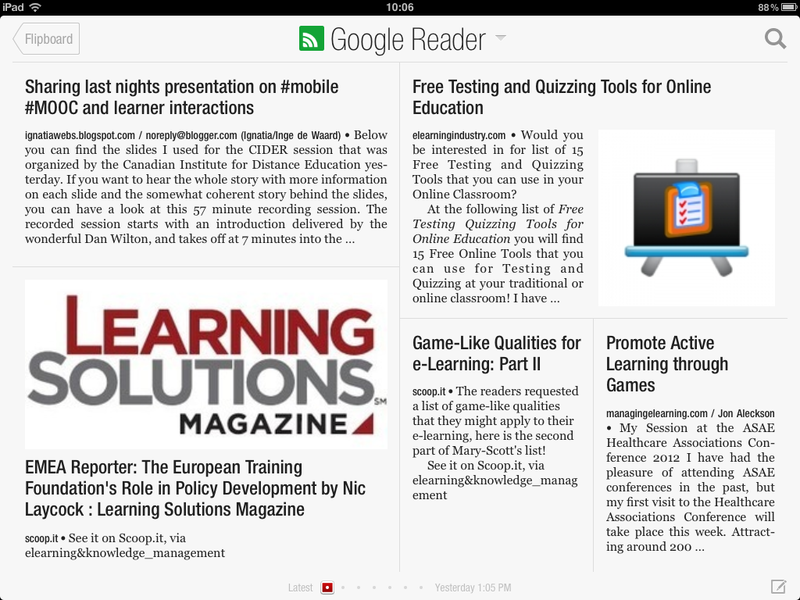 When I find a blog I want to read more often I will subscribe to it with Google reader. It will collect all new posts through RSS. Selecting the interesting ones and reading is something that I don’t like in Google reader at all, I use Flipboard for that purpose. Flipboard is a mobile app that creates a magazine like interface on several streams. These streams can be fed by other tools like Twitter, Linkedin and Google reader and I love it. You can browse through the blogs very fast. because it will show you a part of the post, you pick out the ones that interest you and read them. I love it. There is another tool like it; Zite. Zite will show you information based on keywords you give in. It also has a magazine like interface and the advantage is that you will get information from outside your standard network. I also use aggregation sites, they will select information for you and inform you on a daily or weekly basis on interesting posts. ELearninglearning is the one I use most intense, but there are more like ‘Working smarter Daily‘. Linkedin is an important application for me (although I don’t like their mobile app at all), I use it a lot to network and connect to people. It also gives me a constant feed of information (again through Flipboard). Easygenerator also has a Linkedin group and I take part in a few other groups. For me Linkedin is the central social application, my tweets and blog post are also published on my Linkedin page, it is my professinal homepage on the web. I have a private Facebook account too, but I hardly use it. Easygenerator has a Facebook page, we are using that more and more. We did consider creating a community there for our free edition, but in the end we decided to go with Yammer (see communities). We now use Facebook more for announcements and things like that. I use twitter to announce things (posts, news and share interesting articles that I find). Following others in twitter becomes more and more a problem if you follow too many. Again I use the Flipboard app most of the times to go through all tweets. I have an account on Scribd and it is public, but I only use it to embed PowerPoint presentations into my WordPress blog. I do have Pinterest and bit.ly accounts to collect interesting links. I use them more for my private use, storing things that I want to read later, than that I publish stuff. I love the X-lite application. It brings my land line phone to my laptop, wherever I am. When you call me on my Rotterdam office number, you will reach me through my laptop, where ever I am. I love it. In our company we use Microsoft Lync (sort of internal skype). I use Skype but lately I use gotomeeting and gotowebinar more and more to connect to people outside our company. They give better quality and more functions than Skype. I noticed that I use email less and less and that I hardly make any calls on my cell phone anymore. I do use apps like WhatsApp instead of text messaging, unless somebody doesn’t have an account. Whatsapp is also the application that connects me to my wife when I’m traveling. We started a newsletter recently for the users of our free edition. We choose to use MailChimp and I must say it is really good. It offers everything you need (forms, templates, list) for free and with a clear interface and process. You can have 2.000 subscribers in the free version, for more you have to start paying. We have a community for our partners build in DotNetNuke. I don’t like it at all. It is sort of OK for exchanging files and information, but it is impossible to setup, hard to maintain and had a terrible interface. We will move to something else probably. We did setup a community for our free users in Yammer and I like that a lot more. Flexible, easy and accessible. The only thing is that it is build for internal corporate communities. Even though you can use it for external communities the whole process and communication is aimed at internal corporate communities. Can be really confusion sometimes. I’m a dedicated Dropbox user for four years now. Everything I create I store in Dropbox and I can synchronize it on other computers and mobile devices. Really great. I have a 100 gigabyte account, which I almost completely use. I use Dropbox also to exchange large files (like demo courses) with other people. Lately more and more conferences have an app and I love that. Especially the eLearning guild does a great Job. Schedules, your own Agenda, info, twitter, locations. You name it and it is in there. I haven’t seen an app in any of the European conferences (like online Educa Berlin or Learning Technologies in London), maybe I will even boycott them until they have one. Even after the weeding process it still is a lot and I don’t even mention the things I tried but dismissed (like Klout or Google plus). And these are only communication tools, I’m not even talking about production tools (most favorite tool is MindNode on Ipad for mind mapping). I hope that you get something out of this post and if you have suggestions for improvements, better tools or better solutions, please let me hear. There is absolutely room for improvement. Next Returning to the didactical roots: innovation in eLearning?